From Montana to Arizona, draw violent strikes from bass, walleyes, pike and muskies at these productive reservoirs. As it turns out, the high-strung lady in the office next to you doesn’t have the highest blood pressure of any living thing. That unfortunate title goes to the small fishes swimming in the lakes, ponds, rivers and streams throughout the Rocky Mountain states. Not a single drug could touch the mounting stress these minnows tremble through every day. Everywhere these poor, victimized critters swim, something is looking to eat them. Virtually nothing considers cyprinids (the minnow family) and other baitfishes off-limits. Every time a shadow crosses the water, schools of silver and gold dart for cover. They fear the teeth and claws of birds, mammals and larger fish that could end their short, stressful lives. Indeed, nature is a cruel, terrifying place, but anglers at major reservoirs across the West need to capitalize on the brutality of the food chain. Angling, at its core, is trying to convince large fish to eat whatever is on the end of line. 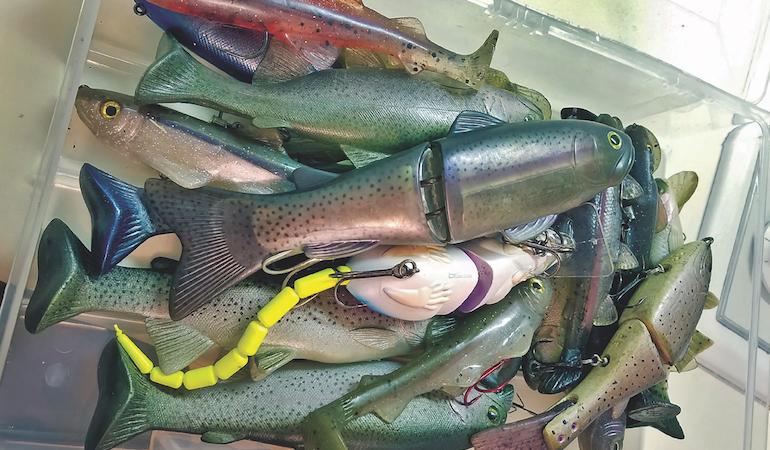 And few lures do a better job than swimbaits of targeting the apex predators in Western lakes that are hell-bent on swallowing anything they can fit in their mouths. No self-respecting tournament bass, muskie, or walleye angler would be caught dead without at least one swimbait rod loaded and ready to go. Swimbaits come in all shapes and sizes. But for black bass — largemouths, smallmouths and spotted bass — an 8-inch model is typically most popular. Its length easily matches hatchery rainbow trout that are stocked in almost every impoundment in the Rocky Mountain and provide an all-you-can-eat buffet for the bass that share the same waters. A 2-pound largemouth, smallmouth or spotted bass can easily swallow an 8-inch trout swimming across its path. Colby Pearson, a tournament bass angler who manages a sporting goods retail store, sees no shortage of swimbaits in all shapes and sizes. Swimbaits are “absolutely my go-to lure” when chasing bass. He says swimbaits, when presented correctly, offer a conducive feeding opportunity for bass to capitalize upon a large meal while expending very little energy. As with all bass angling methods, key considerations must be made for swimbaits, including where you’re fishing, the species you’re targeting and the local water temperature. Some of the nation’s largest artificial lakes are found across the interior West. Arizona’s Lake Havasu, an impoundment of the Colorado River, is one that provides great opportunities for fishing swimbaits. But big water can be difficult to fish. Successful anglers find baitfish amid structure they try to hide in. Piles of structure lie in Lake Havasu, much of it artificially installed to improve bass fishing. Slow-swim a large swimbait that mimics the lake’s native baitfish — numerous chubs, suckers and the pikeminnow — and you can be hooked into the big largemouths, smallmouths and striped bass that call the lake home. These baitfish are typically silver, gold or copper, so start with a lure 6 to 8 inches long that mimics this natural forage. Big water does, in fact, hold big fish, but small waters that hold bass can be fished effectively with swimbaits, too. Throw a swimbait that matches local forage in size and color. You won’t have stocked rainbows, for example, swimming around a golf-course pond, so plan accordingly and bring swimbaits that match the local forage fish. Small fish tend to move more erratically than large fish, so fish smaller swimbaits accordingly, while mimicking what is likely to be golden or red shiners. The same Wild Eye Swim Shad would work well, just in the smaller 2- or 3-inch sizes. Some anglers like to add a metallic paint slash on the sides of these lures to boost appeal. Bass species can react differently to swimbaits. Largemouths usually hit the lures head-first, warranting a fast, hard hookset. Smallmouths hit the lures head-first, but often hit from the side as they streak out from rocks or other cover. Spotted bass hit almost any lure any which way, any time of the year and are often the easiest to catch of all the black-bass species. Getting the swimbait’s hook set solidly in either smallmouths or spots requires some judgement. Consider the angle of attack from the bass and swing against the pressure in the opposite direction. Open up a browser and type “swimbaits for …” and see the laundry list of species Google attempts to complete your thought with. It’s not short. Swimbaits can be used for any piscivorous species — that is, a fish that eats other fish. Walleyes in the big, open-water reservoirs are often targeted by anglers trolling large crankbaits and stickbaits, or by those who “sit on” minnows. But swimbaits are a cheaper, more logical choice for pulling out big walleyes. Walleyes have excellent eyesight, especially in deep water and at night (wherever low-light conditions exist). Using a realistic lure that is virtually indistinguishable from the average baitfish is a smart move. Because they’re among the best-tasting freshwater fish, walleyes are a prized catch that has been stocked in many of reservoirs of the Rocky Mountain states. Many of the locations you’ll find them are ridiculously easy to access, too. Consider Utah Lake near Provo and Salt Lake City. The place is lousy with walleyes, and fishing the gray light of day with 3-inch swimbaits in the spring and fall at the shallow edges of the lake will not only yield walleyes; occasionally, the swimbait ends up in the jaw of a white bass, even a channel cat. Given their sharp teeth, walleyes will ravage swimbaits a lot faster than bass, so don’t use the $100 Huddleston swimbait on these guys. Instead, opt for cheaper swimbaits like the Storm Wild Eye Swim Shad, which comes in a pack of three for less than $5. Northern pike and muskies don’t range across the Rocky Mountain states nearly as far as bass (some states have outright banned these predators), but lakes on the plains of Montana hold the toothy creatures that are classified as warm-water fish. That means they prefer water temperatures warmer than some other Montana fish. They like the warm, slow waters of rivers and streams, and especially lakes and reservoirs. Northern pike grow big in Montana. The state-record, caught in 1972 by Lance Moyer at Tongue River Reservoir south of Miles City, weighs 37.5 pounds. Muskies also grow big in Montana, but they differ from their cousins in the Midwest. More specifically, it is the tiger muskie, a fish created by crossing northern pike with the muskellunge, that’s found in Montana reservoirs, where fisheries technicians first stocked them in the late 1990s to control invasive species while providing a new and exciting fishery. Biologists have since captured muskies more than 50 inches long and well over 30 pounds from Deadman’s Basin Reservoir, where the state-record tiger muskie, weighing in at 30 pounds, was caught in 2010 by Jesse Sanchez. Lots of people in Montana like to fish for pike and muskies. Because they are such voracious fish, they will attack lures and baits and are not too difficult to catch. Lake sites that hold a lot of weeds are especially preferred by pike. The weeds are good camouflage and help the fish hide out until they see a fish they want to catch and eat. Perhaps these predators key on the stark terror a wide-eyed baitfish displays when being chased by the massive, toothy beasts. When you catch one, be prepared for it to knock your socks off! Large swimbaits, such as those from Savage Gear, are perfectly suited for Western anglers pursuing pike and muskies. Both fishes eat large meals without a second thought. Consider targeting them with 6- to 12-inch, soft-bodied models in white, silver or gray with a large paddle tail and a noticeably large eye. Steel leaders are strongly encouraged for pike and muskie anglers, but spool the reel with 50- or 80-pound braid that makes it easier than monofilament to pull a large lure and a much larger fish. In addition to the species you’re trying to catch, water temperature associated with that species is important when fishing swimbaits and other lures. Water that is extremely hot or cold usually delivers slow action. Hot water doesn’t hold much dissolved oxygen and cold-water simply slows down a fish’s metabolism when it drops below their comfort zone. The limits for both extremes vary with fish species. When water temperatures are at extremes, work swimbaits slowly, twitching or twisting the lure to elicit that strike. In ideal temperature ranges for your target bass species, swimbait fishing is fairly straightforward. The fish are hungry, so feed them! Feed them big meals – big, rubbery ones — and don’t be surprised when your line goes tight. Whoever invented the curly-tailed crappie jig was brilliant beyond his or her years. Few things are more effective for papermouths than the erratic flapping of a small, soft-plastic body on a light jighead. Few things, that is, except swimbaits. As the crappie bite heats up this spring, look to small, 1- or 2-inch swimbaits to land that first true slab crappie of your year. Every year, anglers find themselves catching their biggest black and white crappies of the season when it’s still too cold to ditch the sweatshirt and too warm for ice to cling to the surface. The largest crappies come shallow first to stake out the best spawning ground. The recent ice-out at high-elevation lakes, like Montana’s Tongue Reservoir, means fish are on the prowl, feeding aggressively as they wait to spawn in the coming months. There is no better time to throw a swimbait for those trophy crappies than right now. Most warm-water fishes (crappie included) feed all winter long, but the arrival of open surface water brings a smorgasbord of foods to small fish, like bugs and bird droppings. Those little fish are waiting with open mouths to catch what falls, and larger fish are waiting to eat those fish. Yes, worms, leeches and minnows can be effective baits for crappies. But small swimbaits will hit the mark, especially when fished with slight, erratic movements in vertical, or near-vertical, conditions over suspended schools of crappies.